White EVO coming to Best Buy | Android Blast! If you want a Sprint EVO but don't like the color you can pick up a white version very soon. Best Buy will be selling white versions of the Sprint EVO on July 11, and you can pre-order yours today. 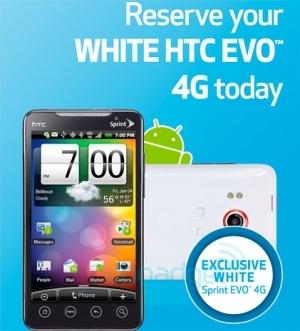 The white EVO will only be available at Best Buy until August 8 when the Sprint stores will get their stock. Other retailers will be able to offer the white EVO in September. The price should remain at $199 with the 2-year contract and mail-in rebates.